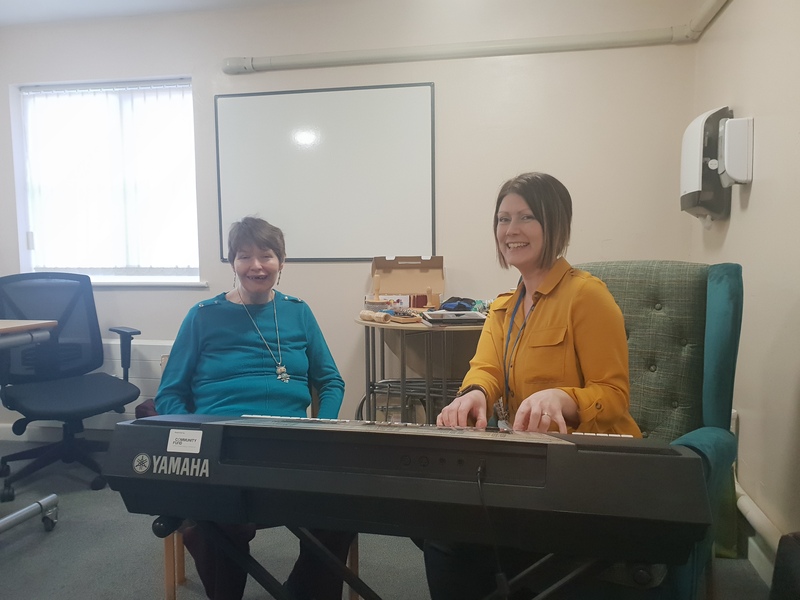 Residents at Greenside Court, Exemplar Health Care’s specialist care home in Rotherham, are benefitting from a unique form of therapy which uses music to support development, rehabilitation and wellbeing. Greenside Court has partnered with Chroma, to introduce a qualified music therapist to the home to deliver a series of neurologic music therapy sessions with residents over the course of ten weeks. Chroma is the UK’s leading national provider of arts therapy, using music, drama and visual arts to help people of all ages facing issues ranging from neurological damage such as dementia through to emotional and social problems. Chroma’s neurologic music therapist Rebekah Keenan is working with residents on a one to one basis to deliver neurologic music therapy, a form of psychological rehabilitation which uses music, sound, instruments, and music technology to support them. Each hour-long session is unique to the individual, Rebekah’s goal focused approach to neurologic music therapy means that each resident can focus on exercises tailored to their development and personal goals, including improving speech and language skills, motor skills and cognitive function. Greenside Court resident, Vicky, 40, who lives with Huntington’s Disease, is in her fourth week of neurologic music therapy sessions with Rebekah. Speaking about Vicky’s progress, Rebekah said: “Working on speech skills is a key focus in Vicky’s sessions, and I’ve noticed a great improvement, especially immediately following a session, when Vicky’s speech becomes much clearer and more spontaneous. “We work on pronouncing words, finishing phrases and putting sentences together that are useful to Vicky, such as ‘can I have a cup of coffee?’. “By singing these phrases along to the piano, the rhythm of the music stimulates the brain to enable patterns of speech to come more naturally, which helps Vicky to speak. We also sing songs together that are familiar to Vicky as the familiarity of the words mean these words and phrases can come automatically to her. “As well as speech development, we also work on motor skills, and work with a physiotherapist at the home, who advises on the types of movements that are most beneficial to the individual. “I work on connecting the rhythm of the music to the movement, in Vicky’s case that involves working on balance and co-ordination, moving from a seated to standing position and walking across the room. “Each session is completely individualised and all programmes are goal focused or emotionally driven too. Vicky’s mum, Gill, said: “Vicky really enjoys the neurologic music therapy sessions. I recently sat in on one of the sessions and it was a really great process to feel part of. Vicky walks to the beat of the music and sings along to songs that she knows. Adam, who also lives at Greenside Court and is working with Chroma, is developing breathing exercises during tailored neurologic music therapy sessions with Rebekah, which he says have been really effective. Greenside Court is one of Exemplar Health Care’s 26 care homes and provides specialist nursing care to people living with neuro-disabilities, brain injury and stroke and mental health conditions.